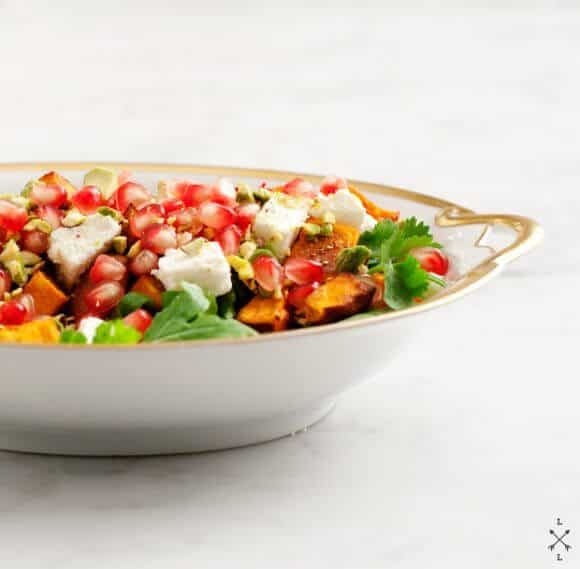 A delicious winter salad with feta, crisp pomegranate seeds, roasted sweet potatoes, cilantro, and tangy vinaigrette. 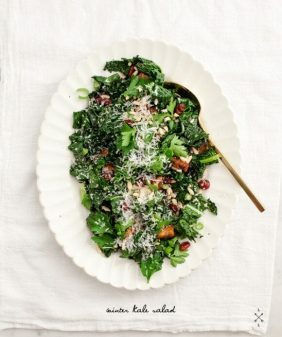 Perfect for a detox or holiday dinner. Aside from a short Christmas morning trip to the emergency vet (everyone’s fine, false – yet expensive – alarm) we had a pretty relaxing day. We consumed tons of food, wine, cookies, more wine, and a few extra (unnecessary) rounds of dessert. With New Years right around the corner, the indulgences aren’t over yet… but all the more reason to pack in veggies along the way. This is a variation of this sweet potato salad that I was obsessed with at the beginning of fall. I made it a little more festive by using red pomegranates and bright green pistachios. Roast the sweet potatoes: Preheat your oven to 400 degrees. Drizzle the sweet potato cubes with some olive oil, salt, and pepper, and roast in the oven for 20-30 minutes, or until the edges start to turn a darker brown. Make the dressing: Whisk together the olive oil, garlic, honey, vinegar, salt, and pepper. Taste and adjust. 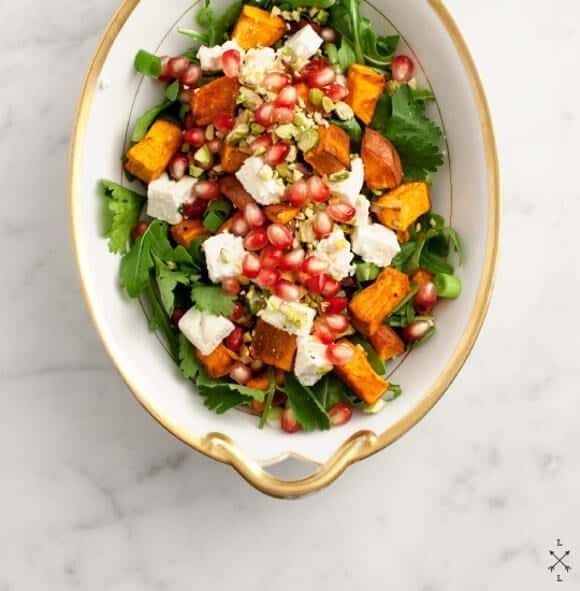 Assemble the salad with the roasted sweet potatoes, greens, pomegranate, feta, pistachios, cilantro, and scallions. Toss lightly in the dressing and serve. I love the use of the rarely used in season pomegranates with sweet potatoes. Such an odd yet magical pairing! Mmm, mmm! This sounds so good! I definitely want to try it 🙂 . Oh heavens. I need this so bad. SEW BAWD. This looks freaking fabulous! Yum! Jeanine/Jack-awesome recipe! 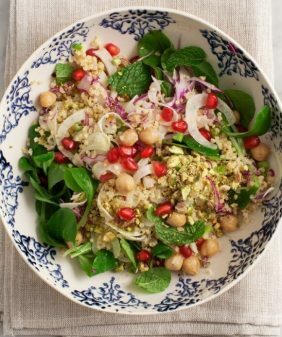 I love pomegranate seeds & am always looking for creative ways to incorporate them into my meals – thanks! Yet again, your pictures are beautiful! 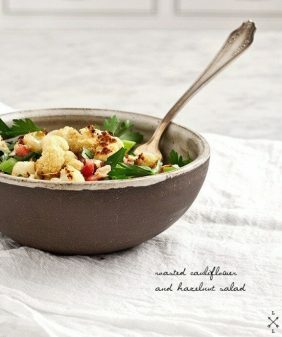 Such a beautiful recipe and a novel combination! Have to try this. The photos are gorgeous. So festive! I need to incorporate pomegranate seeds into my dishes more often. This looks so elegant!!! Yum! Am going to try this with some substitutions since that’s what I have on hand. Butternut for the sweet potato, gorgonzola for the feta and all spinach leaves. Thanks for the inspiration (and the beautiful photos as always)! Yum! Am going to try this with what I have on hand: substituting butternut for sweet potato, gorgonzola for feta and all spinach leaves for mixed greens. Thanks for the inspiration, and the beautiful photos (as always). those sound like great substitutions, I love using up what I have on hand, hope you liked it! Yum! 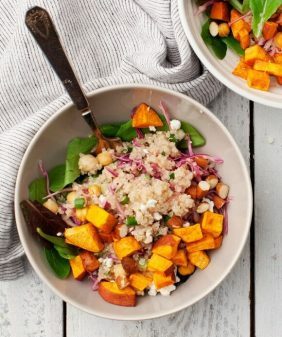 A simple delicious salad, nothing beats a generous helping of roasted sweet potatoes to take a salad to a whole new level of wonderfulness if you ask me! great post! this is very similar to the quinoa w/sweet potatoes salad i’ve been making that was featured in a recent issue of food&wine mag (from nov 2012, i think). My husband who often refers to salad as rabbit food was obsessed with this salad- he said it was the best salad he has ever had in his life. It was so good and surprisingly filling. I shared this recipe in my most recent weekly meal plan on my blog, thank you! Hi Emily, yes… love to hear that! Thanks for sharing! 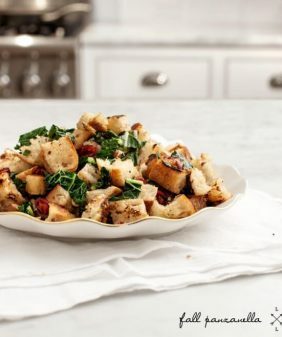 I love this recipe, it is my favorite fall salad!!! Oh how I wish my sweetheart loved cilantro as much as I do! 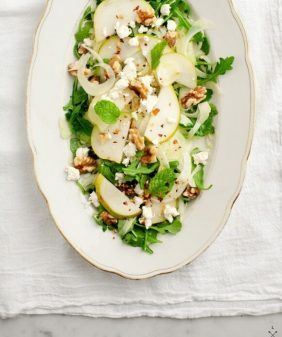 But a little mustard or radish green might be almost as tasty in this salad. I know we’ll enjoy it. Love the idea of the pistachios. They’ll be a nice change from the nuts and seeds we usually put in our salads. How many does this serve? I’m going to make this for 8-9 people.